Secretary-General António Guterres addresses the High-Level Segment of the 37th Session of the UN Human Rights Council. “It is an honor for me to be here again today and this year, marking the 70th anniversary of the Universal Declaration of Human Rights,” UN Secretary-General António Guterres told the opening of a four-week session in the Swiss city, referring to the landmark document adopted in 1948 proclaiming the inalienable rights of every human being. 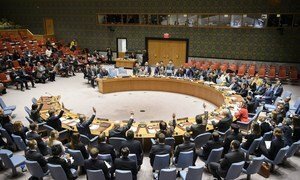 The session, which runs through 23 March, opens at a time of escalating violence in Syria, where civilian causalities have spiked, a development that prompted the UN Security Council over the weekend to adopt a resolution demanding a cessation of hostilities throughout the war-torn country for at least 30 days. It was Mr. Guterres’ first opportunity to address a UN body after this action. The Human Rights Council is an inter-governmental body of 47 States responsible for promoting and protecting human rights around the globe. Mr. Guterres highlighted how human rights are fundamental to preventing conflict. “In today’s world, it is also by ensuring the primacy of human rights that conflict can be prevented,” he said, noting that all the crisis situations currently being examined by the Security Council are invariably accompanied by human rights violations and abuses and that his office is ready to help the 15-member body strengthen its preventive role. The UN chief also underscored that the goal of ensuring diverse, inclusive, peaceful and sustainable societies on a healthy planet under the 2030 Agenda for Sustainable Development can be achieved only by promoting and protecting human rights. Mr. Guterres went on to warn that the words of the Universal Declaration are not yet matched by facts on the ground, noting that gender inequality remains a pressing issue, there is a groundswell of xenophobia, racism and intolerance, including anti-Semitism and anti-Muslim hatred, and refugees and migrants are often denied their rights, including the Rohingya Muslims in Myanmar. “In my experience, the Rohingya are one of the most discriminated against populations in the world – and that was even before the crisis of the past year,” he said, stressing the importance of reconciliation. Further, Mr. Guterres pointed out that there is still some resistance to support UN action on human rights. “We must overcome the false dichotomy between human rights and national sovereignty. Human rights and national sovereignty go hand in hand. There is no contradiction,” he said. In his address, UN High Commissioner for Human Rights Zeid Ra’ad Al Hussein, also welcomed the Security Council’s unanimous decision on a 30-day ceasefire in Syria. However, he emphasized that the resolution must be viewed against a backdrop of seven years of failure to stop the violence: seven years of unremitting and frightful mass killing. Mr. Zeid said east Ghouta in Syria, Ituri and the Kasais in the Democratic Republic of the Congo, Taiz in Yemen, Burundi, Northern Rakhine state in Myanmar have become some of “the most prolific slaughterhouses of humans in recent times” because not enough was done, early and collectively, to prevent the rising horrors. “So long as the veto is used by them to block any unity of action, when it is needed the most, when it could reduce the extreme suffering of innocent people, then it is they – the permanent members – who must answer before the victims,” he said. He commended France for championing a code of conduct on the use of veto, noting that the United Kingdom has also joined the initiative, now backed by over 115 countries. “It is time, for the love of mercy, that China, Russia and the United States, join them and end the pernicious use of the veto,” Mr. Zeid said, naming all the Council’s permanent members. For his part, the President of the UN General Assembly, Miroslav Lajčák, spotlighted the role of the Universal Periodic Review – a peer review mechanism for the assessment and advancement of human rights in all 193 UN Member States. Miroslav Lajčák, President of the General Assembly of the United Nations at the 37th Session of the Human Rights Council, Palais des Nation. “The Universal Periodic Review has now entered its third cycle. It has been over ten years since the General Assembly adopted the resolution to begin this important process of review. And, I believe that our multilateral system is stronger with this mechanism as part of it,” he said. There are still opportunities to make it better. “When assessing the success of the Universal Periodic Review, what is most important is its impact on people’s lives,” he said.